I know this winter has been unseasonably warm, but there’s no doubt in my mind that a full-fledged winter is coming, and that means snow boots (or rain boots, for those of you lucky enough to escape brutal winters like Chicago has). Now that I have owned both Bean Boots and Hunter Boots for over a year, I feel like I can give a more accurate and thorough review of them to help everyone make an informed decision about which shoe is right for them! Obviously, the style and overall look of each of these shoes is very different. I can’t speak for your own personal style, and I’ve seen both look adorably styled in countless outfits – but if your concern is like mine was before I started college that Bean Boots are ugly – I promise you are wrong! My dad was adamant that I would love those shoes, but it took me two years (and a horrible blister experience with my Hunters) to come around to it…and I haven’t touched my Hunter Boots since! Hunter Boots are a lot heavier, and have less traction than Bean Boots – but for super heavy rains, they will keep your legs (and leggings/jeans) dry – a major plus. Bean Boots are great for any terrain, especially snow and are so incredibly comfortable, it kinda feels like a luxury when I get to wear them to work! There are a lot of people that still say they love these boots…but if I’m being perfectly honest, I don’t know any of them personally. My personal opinion (and that of almost all of my friends) is that these boots are clunky, rub your heels completely raw to the point of literal bleeding even with the cute socks you can buy, and after about two years of regular use, the soles of mine wore down and started to leak a little bit in heavy rain. Like I said, I was very against these boots at first (cut me some slack, I hadn’t seen any pictures of people styling them so adorably, and these really weren’t on my radar yet!) but after consistent blister problems and some leaking in the toes of my Hunters, I was ready to take the plunge and try these out. One downside is they are always backordered for months – you have to order them in August if you want them in time for winter – but they are worth the wait! They’re comfortable, more flexible, and L.L. Bean will repair them in the unlikely event that they do ever get worn down or just a little bit too much use! Sizing Guides for Both Boots! No matter which boot you decide on, I want to make sure you get the best possible fit, because that is how you will avoid any blisters or discomfort! Bean Boots run large – order one size down from what you normally wear. (I know you are thinking, “but I will wear them with thick socks!” They know that…and the site (and myself) still recommend that you order a size down) Trust me! They also come in different heights – from what I have gathered, and what I own, the 6″ is the most common and popular. They are a medium length that hits a little above your ankle, great for tucking jeans/leggings into them, and pairing with boot socks. If you are really going to encounter crazy amounts of snow, consider the 8″ or the fleece-lined ones, but otherwise 6″ will do just fine. Hunter Boots only come in whole sizes, so if you are a half size I recommend going a size down. Again, based on personal experience, having a size that is too large will triple the amount of blisters you get. Otherwise, these seem to fit pretty true to size. (Again, don’t be fooled by the thick sock trickery – boot companies like these know how their boots are typically worn, and they account for that when creating their sizing guides!) With these boots being so common and easy to find, absolutely try them on in a store first to make sure. Bring some thick socks, walk around in them, and know that they do stay pretty stiff for most of their lifetime, so don’t assume they’ll be overwhelmingly broken in later on. My final recommendation? My Bean Boots have never hurt my feet or caused blisters…and my Hunter Boots have been in time-out for over a year now. Both are great boots – but I certainly don’t see myself switching back anytime soon! If you have any questions at all about sizing, deciding, or styling either pair, leave me a comment! I’d love to hear from you! I could not have stumbled upon this post at a better time. I have never owned a pair of rain boots, and the rains have started here in Los Angeles and we are expecting some serious storms. I have always wondered what the appeal to Hunters are, this doesn't answer it, LOL, but it answers whether I want to try them or not! 🙂 Thanks for the honest info! So I'm currently a senior and heading off to college next August. I already own Hunter rain boots ( brand new from Christmas ), but I have fallen IN LOVE with bean boots. They're very pricey, but I'm thinking about splurging on them…thoughts on that if I already own Hunter Rain boots? I don't want to waste money on a pair of boots if I already have one, but I feel like my rain boots can be year around and the bean boots could be winter only? I'm just not sure if two pairs of boots are worth it / necessary for college. *note* my boots do not give me blisters or hurt in any way, I just love both of the boots. Thoughts? Loved the post! I have a sizing question. I usually wear a 7.5 but go up to an 8 in heels or shoes where the toe is slimmer. I don't really have wide feet as the wide options I've tried are too big. I was thinking of ordering the 6 inch in a size 7. What are your thoughts? Thanks! Hi Gisela! 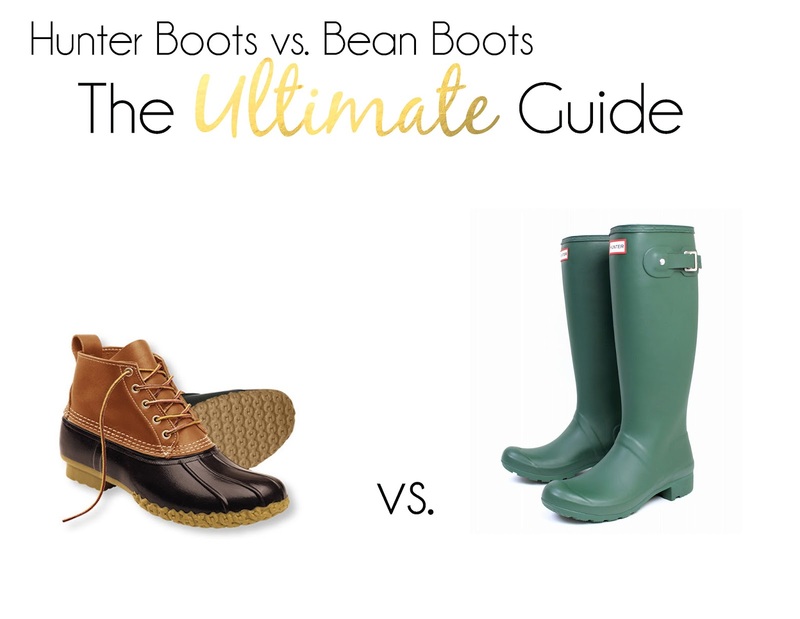 That's a great question – are you wondering about Hunter Boots or Bean Boots? Neither shoe has a slimmer toe, so I think you wouldn't need to worry about going "up" a size. If you are thinking about Hunter Boots – I recommend getting a size 7! If you are talking about Bean Boots, I would say get a 6.5! The great news about these shoes is unlike heels they aren't trying to be slimmer or smaller in the toe area, so I think you will be just fine! Let me know if you have any other questions, I hope this helps! Thank you for your reply! I realize I wasn't clear on my first post, I really shouldn't be posting so late at night. Haha! I am talking about the Bean Boots. I believe they don't make 1/2 sizes? It's good to know that they don't make the toe slim. Thanks again! Hi Gisela – no worries at all, apparently I shouldn't write first thing in the morning! I meant to say that you should order a size 7 in the bean boot, you're correct they don't make half sizes! These really do run large, and I ordered down from my typical size and I'm definitely glad. They fit perfectly! My mom gave me a pair of her bean boots that are almost as old as I am. I love them and man do they last! A great investment. They're amazing! I wish I had listened to my dad sooner – I totally passed up on an offer of free boots several times before freshman year started! Hi Debra! Great question – if she needs the Hunter Boots in a size 8 I would suggest ordering a size 7 in the bean boots. They’re designed to run large, so that should be the perfect fit for her! I have both…and love them both! Headed out for a Fall hike in the cold rainy woods today. LL Bean today!